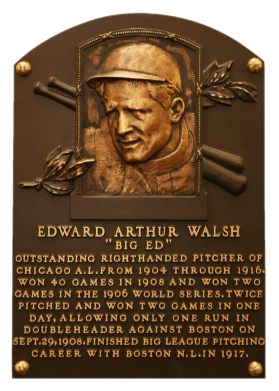 Perhaps no other pitcher threw the spitball as successfully as Ed Walsh. While his arm gave out after only seven full seasons as a starter, he recorded nearly 170 of his career 195 wins during that span. 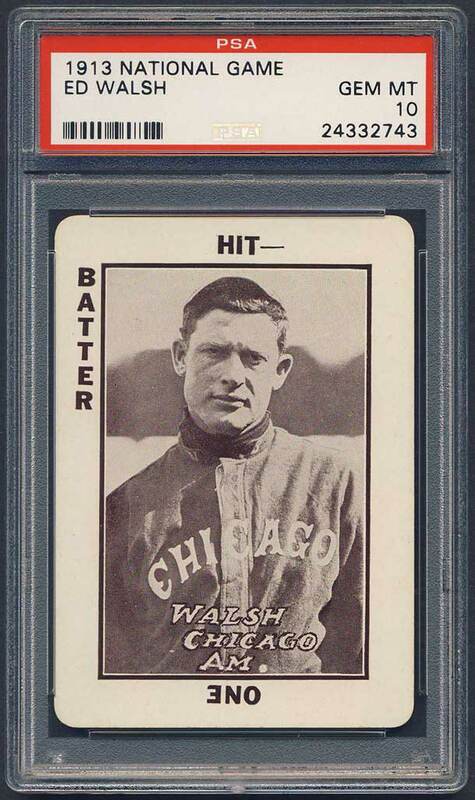 In 1908, he pitched 464 innings for the White Sox on his way to 40 victories. He led the AL in games pitched five times, innings pitched four times, games started three times, and in strikeouts twice. "Big Ed" had a career 196-126 record with a 1.82 ERA, the lowest average of all time. 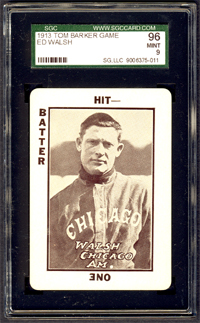 Comments: T206 was the first portrait of Walsh I bought - a PSA 5 acquired in February, 2003 via eBay. I picked up another PSA 5 with a different back in September, 2005. 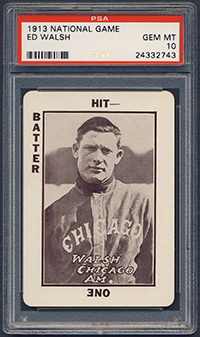 Several other HOFers were represented with a T206 card so I decided to swap it out by picking up a 1913 National Game card. 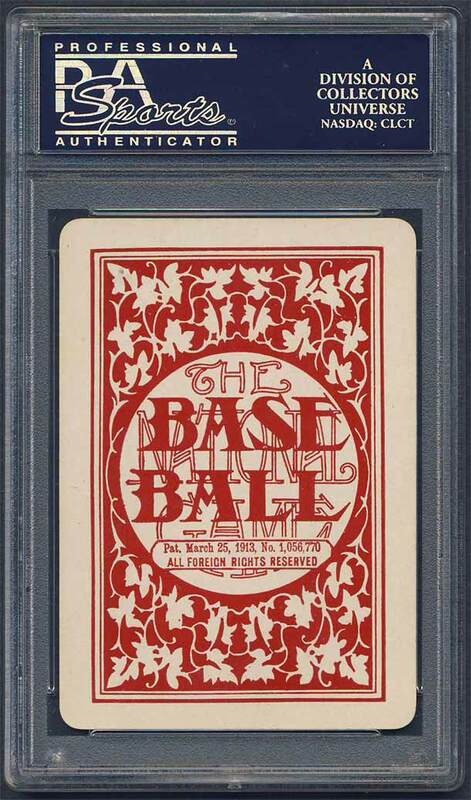 It was graded EX by PSA and purchased through a friend in the hobby (LTS) in May, 2006. I upgraded to a PSA 7 with an eBay win the following month. 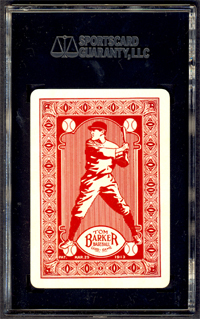 Then, I swapped it out for a PSA 8 1913 Tom Barker example in August of that year. In July, 2011 I upgraded again when I bought this SGC 96 example from eBay seller Howard Chernick. 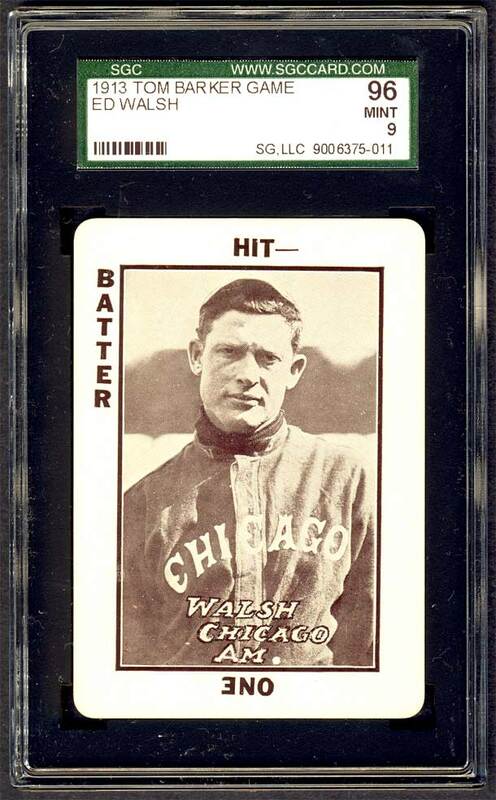 UPDATE: This most recent Walsh purchase, a PSA 10 National Game card, was a total impulse buy. I had no intention of upgrading the SGC 96 Barker game card but came across the opportunity on eBay in Jan. 2016. I watched the auctions closing seconds and placed a last second bid for $209. This was less than what I paid for the Barker. It held up and I won at $186! I was the new owner of a 100+ year old gem beauty. The patent date on the ornate red-and-white backs identify this as a Mar. 25, 1913 issue. 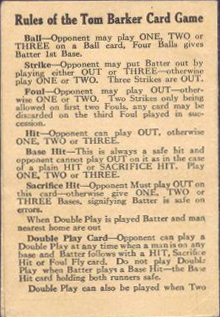 Fronts of the 2-1/2" X 3-1/2" cards have a black-and-white photo and a pair of baseball play scenarios used to play the card game. 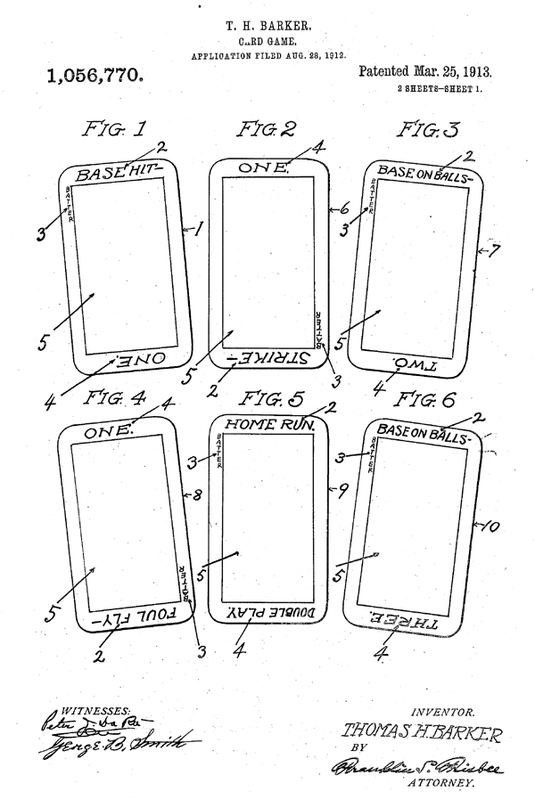 Corners are rounded. The set contains 43 identified player cards, a group of nine action photos in which the players are not identified and two header cards. 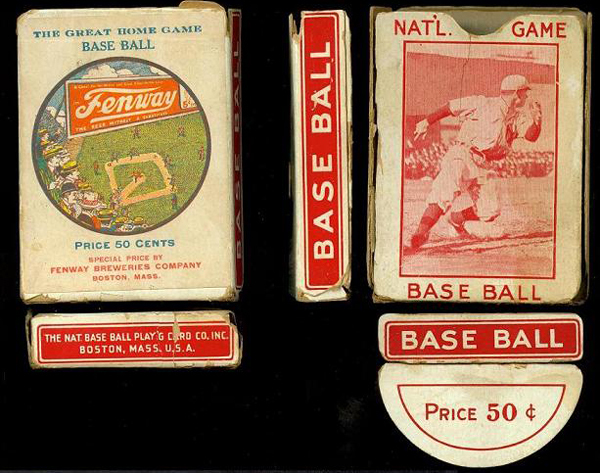 The "Tom Barker Game" set is nearly identical in format to "The National Game" card set. 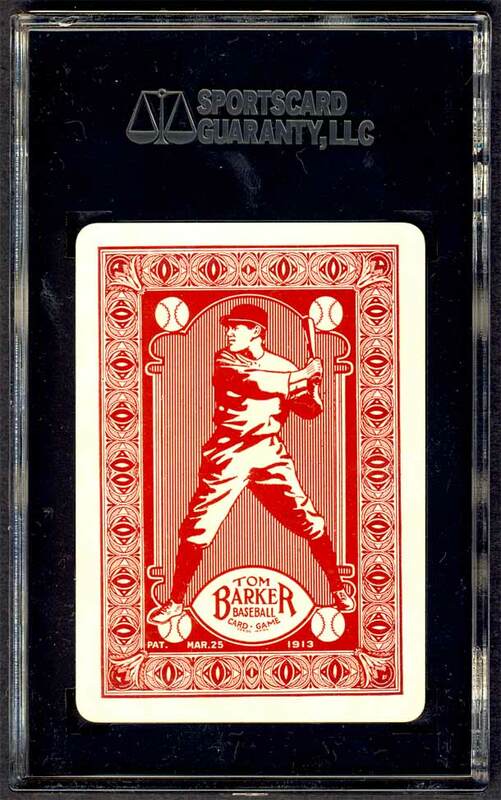 The Tom Barker issue features a different back design of a red-amnd-white line art representation of a batter. The set originally sold for 50 cents.